Children’s literature scholar Rudine Sims Bishop says that books have the power to be mirrors, windows and sliding glass doors. 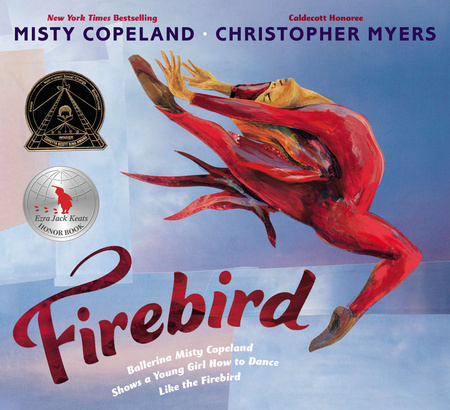 Firebird (Putnam, 2014), the award-winning picture book written by American Ballet Theater soloist Misty Copeland and illustrated by Christopher Myers, is a beautiful celebration of that truth. In her children’s book debut, Misty shares the touching story of a girl whose faith in her dancing dreams falters until she meets a reflection of who she can be. Entering the world of ballet at 13, Misty looked for images of herself too. Through her talent, commitment and passion, she became the third African American soloist in the history of the American Ballet Theater. The previous black soloist had danced two decades before. Where was her mirror? Misty found it in pioneering ballerina Raven Wilkinson, a soloist of the 1950s Ballet Russe. Firebird, the title role Misty played in the ballet of the same name, is a love letter to kids who see a “longer than forever” distance between where they are and the soaring heights they can reach. Misty’s poetic story soothes and inspires, affirms and applauds. How did your beautiful picture book, Firebird, come to be? Please share your path to publication. What were the toughest and most rewarding moments? The children’s book was actually the first idea. I love working with kids and mentoring young people so the children’s book was going to be an extension of my desire to bring the performing arts and classical ballet to kids. My amazing editor, Stacey Barney, who’d been talking about a children’s book with my manager, happened to be meeting with Christopher Myers who mentioned that he’d wanted to find a way for us to work together. I think it was meant to be, this wonderful collaboration. Chris and I got to know one another throughout my writing process and the creation of his illustrations. I came to know more about him as an illustrator and he grew to know me as a ballerina and emerging writer. He even came to some of my performances and got to know my mentor, the legendary ballerina Raven Wilkinson. It was out of the beautiful mentoring relationship between Raven and me that the story throughout the pages of FIREBIRD was written and evolved. Your lyrical style and voice, full of emotion and authenticity, draws readers in right away. How did your life journey inform and shape your book? Why was it important to tell that story? From the time that I started taking ballet classes at the age of 13, there has been interest in my story. I understand because I am considered an “unlikely ballerina.” But rather than allow my differences to be an obstacle, I decided to stand up and be an example of what can happen when you’re committed to doing something that you love. So many young girls and women of color before and since me have been told that ballet isn’t for them. By telling my story and being on the stage, I hope that ballet will be seen as a possibility and a world in which they can exist and thrive, both on the stage and behind the scenes. Your letter to the reader is lovely and meaningful. There’s a lot of buzz right now about diversity in children’s books. Your book shows why it matters. Could you expand on this quote: “But when I opened up ballet books, I didn’t see myself. I saw an image of what a ballerina should be, and she wasn’t me, brown with tendrils sweeping her face. I need to find ME. This book is you and me . . .” How does your book expand “the idea of beauty and art”? How does it empower ballerinas with big dreams? I think that our life choices often reflect how we see ourselves and if we see ourselves. It’s important to see a living, breathing person who is on a path that may be similar to your own. I remember when I discovered Raven Wilkinson, I felt as if I’d found a missing piece of myself. I identified with her as a black woman and a ballerina. Today, it makes a difference to have her and so many other strong, successful, black women in my life who lift me up when I feel like I can’t do it on my own. It’s their encouragement and support that often keeps me going. That’s what I hope FIREBIRD might do for little girls who need to see a reflection of themselves in such a beautiful, inspiring way. Your book has won many accolades including starred reviews and landing on best lists. How do you measure literary success? What achievements and experiences have made you most proud? I measure literary success by young people and/or their parents telling me that the book really spoke to them or they were able to take something from it and use it within their own lives. Or better yet, they’ve started or returned to taking ballet classes. And even better, they bought a ticket to see a ballet. All of that says success to me because in the end, this has never been about me, rather raising awareness about the beauty of ballet. What do you hope young people take away from your story? Hope. Perseverance. I hope that they take away that all things are possible when you give it your all. What’s next for you as a children’s book author? I’ve enjoyed this journey so much and working with Chris has been truly amazing. Right now, I’m incredibly busy with my ballet career, learning several new roles, but I’d love to do another children’s book. In the meantime, I’m still focused on spreading the word about FIREBIRD. Dancing is my greatest joy. Being on the stage or in the rehearsal studio is where I release. 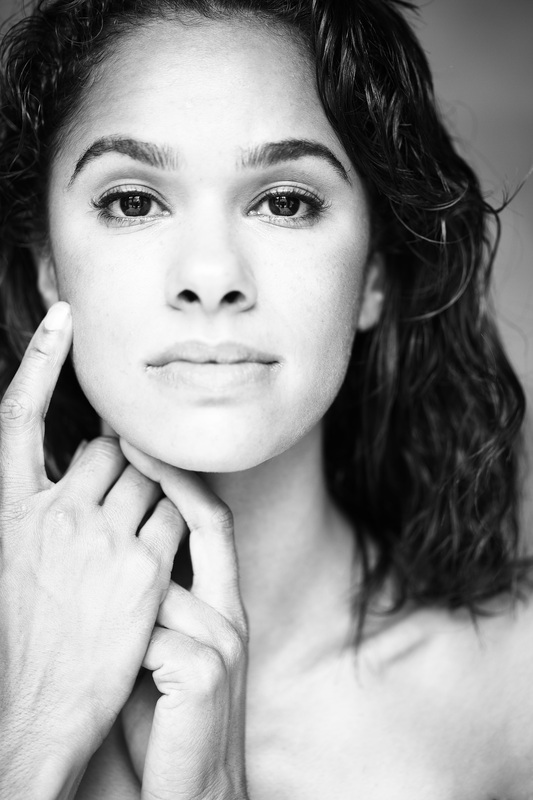 Learn more about Misty Copeland here. This was indeed a great year for girls in sports and girls in the arts. I was so happy to see this one. I love, love, love this book! It’s gorgeously illustrated and very lyrical, as you would expect from such a talented dancer. Brilliant! I think this book transcends color. To me, it’s about the perceived distance between a child’s longing and an adult’s accomplishment. As a former ballet dancer (not professional) and because Firebird is one of my favorite ballets, I was thrilled about the publication of this book. I also have a copy of Life in Motion. I had the pleasure of seeing Ms. Copeland perform Firebird once. It was spectacular.